A bracelet with avanturine and brilliants. The flower carved on the large avanturine is a symbol of prosperity and success. The central stone is surrounded by stylized petals and buds. 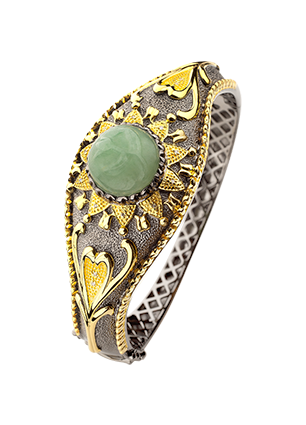 A piece of silver jewellery with a slight hint of the Oriental in modern green-gold colour scheme. It goes with a light-coloured evening gown, with a flower-patterned blouse or with a pareo.